The Grumman G-21 Goose amphibious flying boat was designed as a 10 seat 'commuter' plane for businessmen in the Long Island area. It was soon adopted by the US Navy and Coast Guard, and during World War II it served with United States forces and the RCAF in transport, reconnaissance, rescue and training roles, and was used by the RAF for air-sea rescue duties. It was whilst serving with the RAF that it received the name "Goose". Returning to civilian service after the war, the Goose found use from the wilderness of Alaska to the sunny climes of Catalina. 345 were built, with about 60 still airworthy today, some of them in modified forms, such as the Turbo-Goose (see below). There were a number of modifications of the Goose, but the most numerous were those by McKinnon Enterprises, who made three different conversions. The first involved replacing the Goose's engines with two Lycoming GSO-480 piston engines. The second, named Turboprop Goose involved replacing the engines with two Pratt & Whitney PT6A turboprops. The third and final variant was the Turbo-Goose, which was based on the "Turboprop Goose" described above, but with larger windows, and retractable floats on the wings. 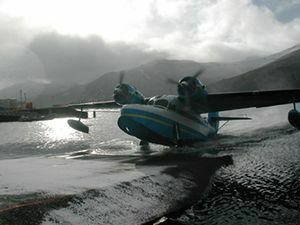 Antilles Seaplanes is to begin manufacture of new technology versions of the Grumman Goose in 2007. It is also seen on the 1980s series, "Tales of the Gold Monkey", a TV adaptation of the movie "Only Angels Have Wings" with Stephen Collins. Information and listing of many Geese. This page was last edited on 6 March 2007, at 09:12.